On November 1, 1940, Mildred and Robert Woods Bliss turned over their estate, Dumbarton Oaks, to Harvard University as an institutional library and collection for “study and research in the Humanities and Fine Arts.” The transitional period of 1936–1940, when the Blisses converted the private estate to a research institute, had been quite intensive, and in January 1941, the Blisses left Washington for Florida and California, to escape the winter weather as well as to give Dumbarton Oaks a chance to develop an independent identity. This letter, signed with so many names, is nevertheless a very simple letter. It is a letter of thanks. It is a letter written by men and women who have found in the house you made an unforgettable happiness, and who feel for it and for you a gratitude of which they take this means to speak. To have created a house in which learning and the arts of music and of talk were equally at home is to have created as fine a thing as men are capable of making. The houses famous for music and for beautiful speech and for the company of those who love these things are not numerous in the history of any time. Dumbarton Oaks which, with an unexampled generosity, you have now given to a great university for the uses of scholarship was such a house, and we who shared it sometimes with you cannot watch your giving of it without these words of our appreciation and our praise. . . . But whatever we remember of this house—whether the music or the voice of Royall Tyler in the winter dusk or the boxwood alleys or the ficus vine or the gray and golden salon with its yellow rug or the galloping bronze horse or El Greco’s blue robed angel—what ever we remember of this house is good and sharp and lasting as all art and learning is. And for these things we write you now our admiration and our thanks. New name for the Courier? New character? Obviously, it will no longer be the Underworld Courier, since all but me are fled. We will try to think of a new name which will be agreeable to our subscriber—should they want to renew their subscription. May we be notified about that last point? Obviously, it should have a new character. We must try to think about that, too. No longer, perhaps, of so light a character, so formless. Possibly, a series of reports—not too long—from each room upstairs. A weekly batch of separate notes giving a picture of the activities as seen by each. Would that please you? Would you like us to continue? In some form or other? We will be guided by your wishes and, meantime, continue much as before till we hear. 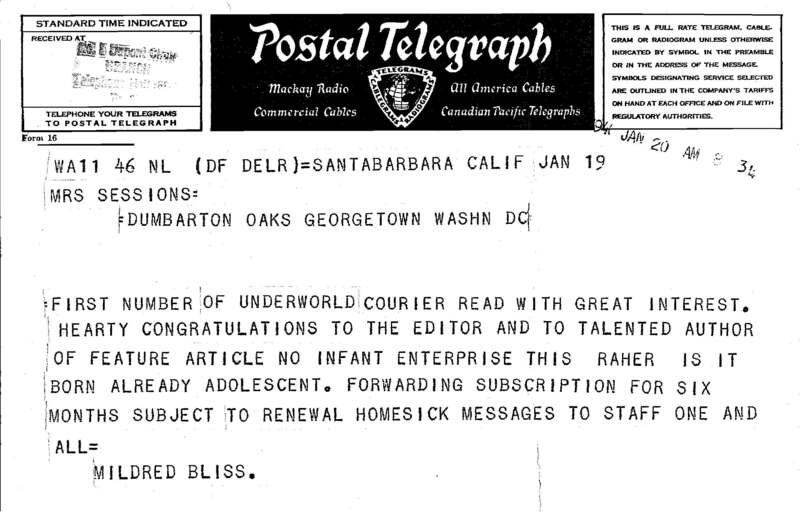 The final edition of the Courier, dated November 1, 1941—the one-year anniversary of Dumbarton Oaks's transfer to Harvard—was a short letter to the Blisses entitled, “The Underworld Courier: An Aftermath (Don't Tell).” Mildred Bliss was quite taken by the newsletter, as is evidenced by her telegraph back to the staff after the first issue, but no record exists of her requesting the news service to continue. Publication of the newsletter did not resume, likely, because the Blisses again took up residence in Washington beginning in 1942. All editions of the Courier are available here, with the exception of Vol. 1, Nos. 11, 14, and 18, which were lost over the years.